Rug reweaving is a common service for Smart Choice. Many of our clients have beautiful, expensive rugs that they want to hand down for generations. 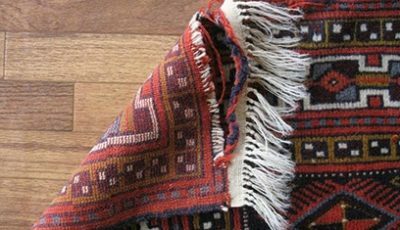 In the case of moth damages or tears, it’s necessary for rug weavers to make repairs by hand to restore the rug to its original appearance. When weaves are destroyed by sun, spills, burns, and regular use, the knots will begin to loosen along the edges of the rug on all sides, especially near the fringe. If not tended to in a timely manner, an entire wool rug will start to unravel. Luckily, a rug with holes or tears can be rewoven to be as strong and beautiful as it once was with the expertise of professional rug weavers like ours! Smart Choice is the BEST Choice! A true professional can repair corners, edges, fringe, and tears in the middle of the rug. Rug reweaving is can be performed on a rug that is machine made or a hand-knotted rug in order to restore it. The purpose of rug reweaving is to preserve the value of your expensive rug so, yes, it can be expensive. However, when you consider the value of your Oriental or Persian rug – and the value of replacing it – you’ll understand why choosing Smart Choice is such a good idea! Inspecting and assessing the true amount of damage. If the holes in your rug are the result of moths or carpet beetles, the infestation will be taken care of first, before any repairs are made. Choosing the correct yarn, color and texture to recreate the rug’s original appearance. This is usually wool, but in some instances may be silk or cotton, especially when re-knitting the warps and wefts. Rebuilding the structural elements. This step may involve removing a larger section so new warps and wefts can be attached to the existing ones and is necessary if the rug holes are very large. Hand weaving every damaged area. 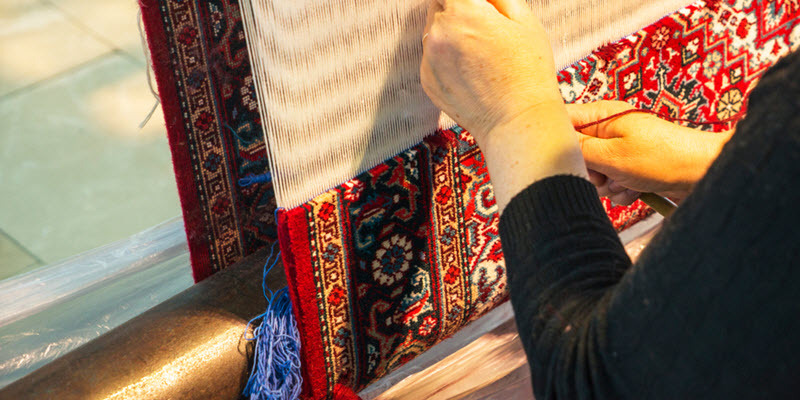 The original knots and patterns are preserved in this stage of rug repair as your rug is placed onto a large loom and our master craftspeople re-stitch every loop by hand. If the damage is too severe for re-weaving, a section can be removed and patched, but only if the area surrounding the tear or hole is in good condition and is a fairly thick pile so that the stitches can be hidden. Trimming the new areas to match the pile height of the original knots. This final step gives your rug a consistent appearance and makes it virtually impossible to tell the repaired areas from the rest of the rug. When we talk about the sides of your rug, we mean the edges without fringe. Overcasting is the primary technique used in side repair. In the overcasting process, the damaged sides must be wrapped or bound with wool to make the edge look even again and to prevent future splits & wear. Once this is done, the rug is no longer in danger of unraveling from the side, because the stitch is anchored back into the weft. A thin edge is used for a rug with a finer pile or shorter knots, while thicker, coarser edges are overcasted for rugs with a thicker pile or longer knots. Pile unraveling can occur anywhere on the rug if the sides are left unrepaired for too long. If your rug has unraveled weaves, the fringe needs to be repaired first, then the foundation of the rug needs to be repaired, and, finally, overcasting can be completed (if damaged). A torn area rug is an eyesore and devalues the rug tremendously, but once the ends or sides of your rug have been repaired they should never have to be redone.